Christmas come early this year because many organizations and individuals have already running iPad Air Giveaway on website, Twitter, blogs and Facebook, such as Engadget Giveaway of iPad Air Courtesy of HopTo not long ago. It is really a sweet gift for Christmas. Are you a lucky guy who has won a free iPad Air or other iPad for 2014 Christmas? If no, Keep your chin up. We are also having some iPad Air Related Giveaway for you. Guess what the Free iPad Air Christmas Giveaway would be? We have been hard at providing the solutions of video format compatibility, video file storage and offline movie enjoyment on iPad Air. If you want to play and watch DVDs, Blu-ray M2TS/MTS, WMV, AVI, YouTube FLV, MPEG, MKV on iPad Air, please check our iPad Air Software Giveaway Page for Christmas. What Can I Get from Your Christmas Software Giveaway? 1. WinX DVD Ripper Platinum: This No.1 fast DVD ripping software in the world has been wrapped in WinX Christmas Gift Pack. It can help you decrypt/rip any DVDs and play Maze Runner: The Scorch Trials, Mission: Impossible - Rogue Nation, Minions, Ant-Man, Terminator Genisys, Inside Out, Pixels, Southpaw, Jurassic World and Tomorrowland and other latest released and copy-protected DVDs on iPad Air/2. 2. WinX HD Video Converter Deluxe: If you encounter the iPad Air video converter giveaway during Christmas, congratulations! This is an an-in-one software that can fit all kinds of videos to your iPad Air/2, iPad mini/2/3/4, iPad Pro, iPad /2/3/4, iPhone and Android as well. It can also download YouTube online videos, edit videos and make photo slideshow videos for playing on iPad Air. 3. iPad Air Software Giveaway for Mac users: If you are using a Mac, you are enabled to get a DVD ripper for Mac and a HD video converter for Mac. 4. 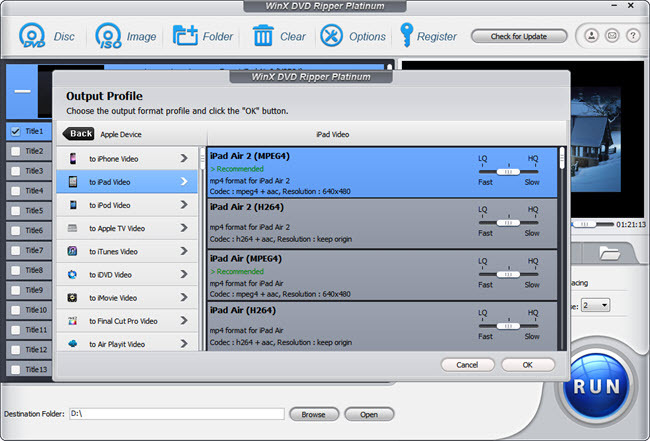 Software customized for your iPad Air: There is another channel to get free software from Digiarty, including iPad Air specified software for Christmas, like WinX DVD to iPad Ripper and WinX iPad Video Converter. The condition to participate is that you agree to run an exclusive giveaway among your readers on a blog, a forum, or a Facebook/Twitter/website page. Send Request Email Now. WinX DVD Ripper Platinum: Windows-based DVD ripper software capable of ripping both DVD disc and DVD ISO image to mainstream videos, such as rip DVD to AVI, DVD to MP4, H.264, MPEG, WMV, MOV, FLV, 3GP, etc. It can also help users faultlessly convert DVD to iPhone/5S/5C, iPad/Air/4/Mini, iPod/5, Apple TV, Android, Surface Tab, Galaxy Tab, HTC, Samsung, Xoom, PSP, etc.